The only details I could glean were that Michlelet Herzog, a religious college in “The Gush” had a week-long series of classes about the Bible. They were always held in the first week of the Hebrew month of Av, and were well worth the time and money invested. 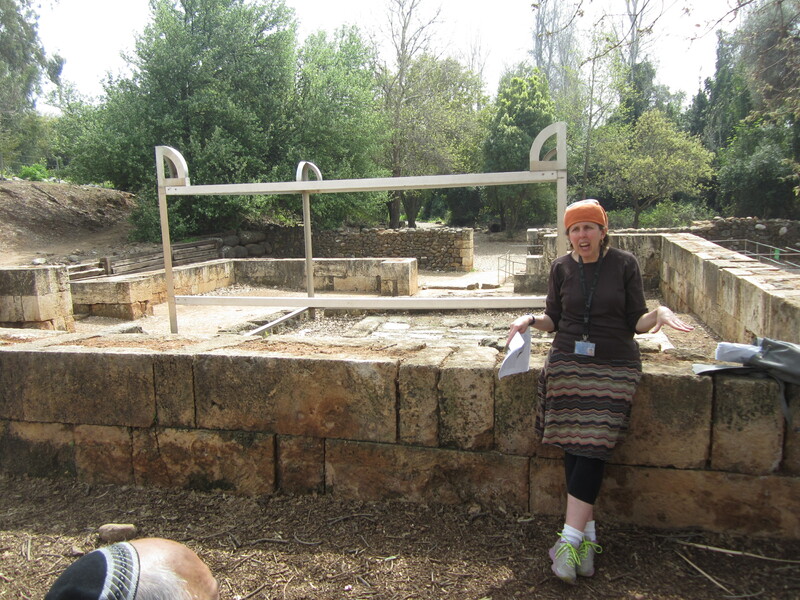 The next summer I traveled south to the town of Alon Shevut in Gush Etzion to Herzog College for two days, to hear lectures on the Bible in English. So often when we anticipate something, the event does not quite meet our expectations. Not so at Herzog–reality lived up to the hype. I’m not sure what I had expected that first year, but whatever it was, I had found more. This year, for the third year in a row I attended the Yimei Iyun Tanakhi–the Biblical Study Days–for both days of English lectures. Once again, I came away with many pages of notes, overwhelmed by the depth of what I had heard. The Yimei Iyun attract people from almost everywhere. Every morning of the week chartered buses deliver students from all over the country. I even met people from the US and Australia who schedule yearly trips to Israel for July or August in order to attend these classes. Directional signs at Herzog College. At top it says, “May you go in peace, and have a safe trip,” and pints to parking to the right and buses to the left. Bottom sign points to synagogue and social hall. The buses disgorge participants in front of the main entrance to the college building. Registration tables staffed by Herzog students stretch across the wide plaza, with signs indicating spots for almost every letter of the alphabet–19 lines in all. Picking up one’s registration materials takes only a few minutes, even on the busiest mornings. The halls are filled with people streaming in many different directions. Sooner or later, everyone stops in the “Drink Corner” to pick up a free cup of coffee or tea, and a cookie or piece of fruit. That’s where I met several people I knew from ulpan class, a fellow English tutor, a woman from my writing group, and two people I remembered from last year. I should not have been surprised at seeing people I knew–about 7,000 people attend lectures during the course of the week. 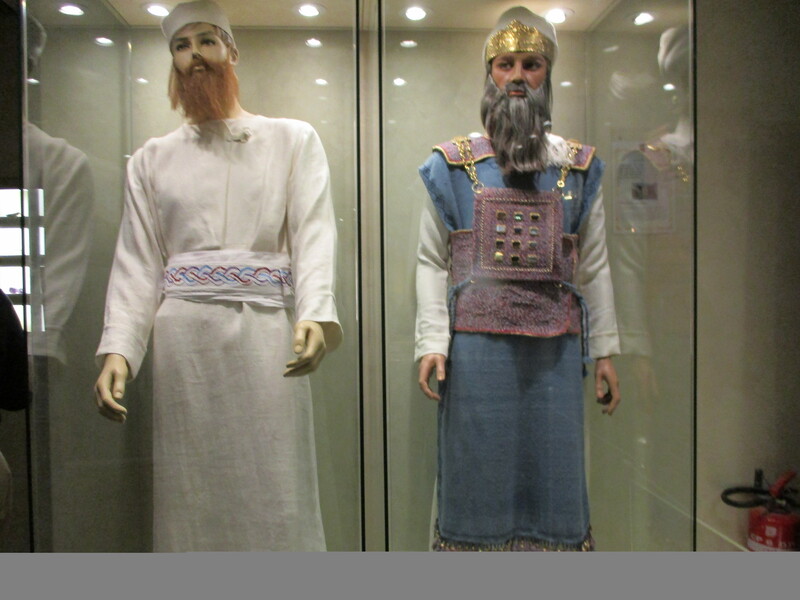 They all seem to be what in the US would be called “Modern Orthodox.” Most of the men wear knit kipot on their heads, and the women cover their hair and wear skirts. But not everyone fit into that category. I saw some men wearing the white shirt, black slacks, and black kipa uniform of the very religious, and I saw some women wearing slacks. The teachers, all top educators, also come from all over. Many teach at Herzog or the Har Etzion Yeshiva, with which Herzog is affiliated. Some lecturers teach elsewhere in Israel, and a few live and teach in the US, England, or other places. In religious settings, men and women do not sit together for serious learning. So every classroom had signs designating an area for men and one for women. But unlike other places, here the signs were ignored–men and women sat together with no complaints. The only time gender segregation was evident was after lunch, when the men gathered in a classroom to recite the afternoon prayers, and the women stood in the doorway waiting for them to finish so we could find seats for the next lecture. I had chosen my classes based on my notes from the last two years. I had put a star next to the names of excellent lecturers to guide my choices. When I checked those notes, I realized that almost everyone I heard had a star next to his or her name, except for one teacher who spoke too fast. Because of the wide range of courses, inevitably I end up listening to lectures about many different parts of the Bible, from Breishit (Genesis) through Divrei Hayamim (Chronicles). Blessing,” when Jacob blesses Joseph’s sons the end of Breishit. Jacob crosses his hands to place his right hand on Ephraim’s head, giving him precedence over his older brother Menashe. In his introduction, Rav Etshalom pointed out that well known stories such as this one are the hardest to teach, because when something is so familiar we do not notice how strange it is. We do not even ask questions about it anymore. That comment could apply to the episodes analyzed in any of the classes I attended. For example, why didn’t G-d accept Cain’s sacrifice? What was the nature of Eli’s sin at Shilo that he, and his family, deserved a curse of such unprecedented severity? What did Elimelech do in the beginning of the Book of Ruth when he left Bethlehem in Yehuda that he and his sons deserved to die in Moav? 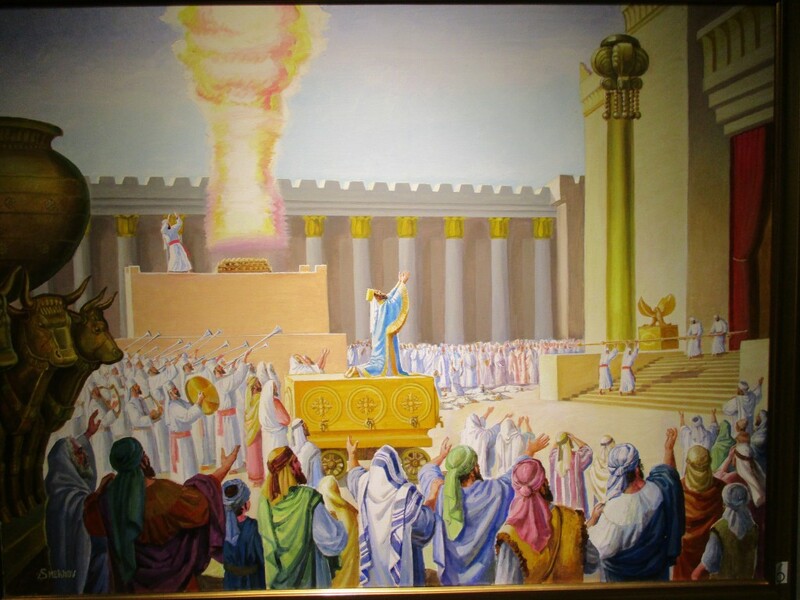 Last Shabbat we read the opening chapters of the book of Devarim (Deuteronomy) in synagogue. Very close to the beginning, Moshe recounts the story of the spies first related in the book of Bamidbar (Numbers). What is most striking about this retelling are the differences between the two versions of the story–16 of them in less than 22 verses. In his lecture titled, “Truth, Perception or Lies,” Rabbi Gadi Dishi reviewed, line by line, the two versions of the incident. It does not seem as if both versions can be accurate reports, so which version is correct? In trying to reconcile the differences, what do we need to understand better? For example, in Bamidbar, the spies are described as princes of tribes, and each one is listed, by name, as a leader of his tribe. Yet in Devarim, Moshe describes them simply as “twelve men, one from each tribe.” He also leaves out the bad report of the land that ten of the spies brought back. Rav Dishi reminded us that only two people listening to him had been alive at the time of the incident. Each was a Prince, his tribe’s representative within the delegation of spies: Calev ben Yephunneh of Judah, and Joshua ben Nun of Benjamin. In Devarim, Moshe wanted the people to understand not only what had happened during the forty years in the desert, he also wanted his listeners to take away lessons for the future. Among these lessons were the importance of trusting in G-d and the leaders of the nation. In not mentioning that most of the spies said the land of Canaan destroyed its people, and that the inhabitants were invincible giants, Moshe emphasizes that the people are going to a good land. Similarly, when he says the spies were ordinary men, he avoids disparaging the leadership of the time. If he reminds them that Joshua had been one of the spies, they might think that Joshua had actually misread the situation in Canaan, that the ten spies saying bad things about the land had been right. Or they might come to the conclusion that Joshua was a failed leader, that he had not been able to sway the other spies to his view that because G-d was with them, they could conquer the land. Thus in stating the group of spies had been ordinary men, Moshe strengthens the new leadership of the tribes of Israel. In stating that the spies said the land is good, and not mentioning the derogatory report, Moshe strengthens the resolve of the people to leave the security of the desert for the uncertainty of a land they did not know. Rav Dishi concluded that Bamidbar is a factual account of what happened. Devarim is a powerful speech, in which Moshe tells a new generation their history in way that will prepare them for their future in the land G-d had promised to their forefathers, and to them. To summarize the whole lecture on the differences between the accounts of this episode in the two books would take pages. This is simply a taste of the learning during the Biblical Study Days. To say I was impressed by what I had heard would belittle the quality of the learning that goes on during the week. This year, I introduced a friend to Herzog. A week later, she is still thanking me for taking her. She is already planning to go back again next year. Shulie Mishkin’s question was moot. We do invite that man—Elijah the prophet—to our seder every year. And to every Brit Milah (circumcision ceremony). Elijah is beloved in our folklore as the helper of the desperate. But the statue of him on top of Mount Carmel, the site of his greatest triumph, does not depict him as beloved or even lovable. This is Elijah at his most zealous for G-d, fire in his eyes, a sword raised over his head, his foot on the shoulder of a man lying under him. This is Elijah triumphant over the prophets of Baal. This is Elijah who brought on a three year famine. This is Elijah who orchestrated a dramatic confrontation with 450 prophets of Baal and 400 prophets of the Asherah on this spot, and showed that G-d is more powerful than the most popular pagan god worshiped at the time. This is the Elijah who stood up against the warrior king Ahab and against the his wife Jezebel. My class on Kings I had studied the stories about Elijah (chapters 17 – 21). Today we were visiting the sites where some of the major events of his life took place. We could not visit Gilad in Jordan, Mount Horeb in Egypt, or Sidon in Lebanon, although significant events in Elijah’s happened in these places. They were too distant to travel to, both geographically and politically. If you’ve studied a topographical map of Israel, you probably noticed that Mount Carmel is not one mountain, but more like a small mountain range running north-south between the coast and the Jezreel Valley. So how can we be sure that this peak of the Carmel, where the Carmelite monks have built their monastery, is the site of Elijah’s confrontation with the priests of Baal? We went up to the top, and looked around. This is the highest point in the Galil, and we could see much of the land spread out before us. Since it is early Spring, the green hillside was sprinkled with red anemones, yellow wild mustard, and purple lupines; pale pink blossoms cover the almond trees by the road sides. The Jezreel Valley below was dozens of shades of green, crossed by the gray lines of roads linking the towns and farms. Because of the height, the wind was brisk, which negated the warmth of the bright sun. I was glad for both my jacket and sunglasses. The spot is called “Muhraqa” and Arabic word that means “burning.” Like many Arabic names of places in the north, it stems from an earlier Hebrew or Aramaic name for the place. “Burning” refers to Elijah’s sacrifice which was burned by fire from G-d.
From this spot on the mountain, it is possible to see north into Lebanon, the land Ba’al worship came from. Jezebel, daughter of the Etbaal, king of Sidon, had brought priests and prophets of Baal with her when she married Ahab, and sought to establish Baal worship in Israel. Baal was powerful because he was the god of rain, all important in lands which depend on winter rain for all their water. So when the people stood on Mount Carmel to witness the confrontation between the prophets and priest of Baal and Elijah, the prophet of G-d, they also could see the choice before them as the choice between their own tradition and the the tradition of the country to their north. 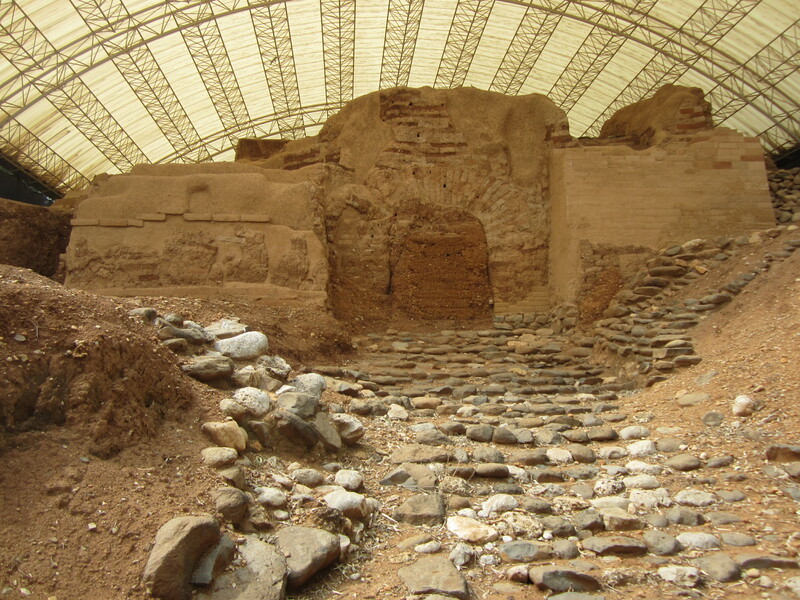 The Biblical text refers to the priests of Baal running down towards Kishon Brook and being killed there. This side of Mount Carmel is steep, and the Kishon Brook runs along at its foot. It was easy to imagine the priests running down the hill in panic as the fire from heaven burned even the water around the altar. They heard the people cry “The Lord is G-d,” and heard Elijah’s cry not to let them escape. And indeed, not one was allowed to escape. In the book of Kings, after the prophets of Baal are destroyed, Elijah sits near the mountain ridge, and sends his servant up to see if the rain clouds are coming. Even today, in the winter, standing on this mountain peak, you can see rain clouds approaching from the Mediterranean. When the first cloud is sighted, Elijah tells King Ahab to go back to his palace, before the roads become too muddy and impassable. And so Ahab rides across the valley at the base of the Carmel to his city of Jezreel. We could see the Jezreel valley from there, but Ahab’s city and palace no longer exist. This is not the first statue of the prophet that has stood in the monastery courtyard. The original statue was carved by a Carmelite monk in Bavaria and sent to the monastery in the late 19th century. The Turks did not believe it was just a statue. Before delivering it from the port where it arrived, they cut off one arm looking for contraband. When they found no weapons or ammunition in the statue, they allowed the monks to take possession of it. The statue stood in the courtyard for many years. But in May 1948 the Syrian army attacked. The Syrian soldiers, however, were superstitious. They did not believe they could conquer the Galil if Elijah stood on the top of Mount Carmel, protecting the Jews. So they destroyed the statue of the prophet. It didn’t help them. The brand new Israeli army fought harder than any of the Arab leaders thought was possible and the Galil remained in Israel. years after his death. Or perhaps, it’s the story of the power of myth, that even a statue of a charismatic leader has power over the enemy. There’s just one problem: it’s not true. The old one-armed statue of Elijah stands today in Nazareth, in someone’s garden. And perhaps the statue protects the garden from invasion by Baal-worshiping beetles and snails.